Jaundice is the condition which affects the liver mostly by the increased level of bilirubin which is a waste product of erythrocytes which supplies the cells with oxygen and hemoglobin by the circulation of blood. Mostly three types are encountered. They are post hepatic jaundice, hepatic jaundice and pre-hepatic jaundice. Post hepatic occurs due to the hindrances in the flow of bile. Pre hepatic damages the liver cells and in Hepatic jaundice all RBC cells are destroyed. The body digestive power will decrease and the liver has problems in metabolising the foods. So it is properly advised to eat the right kind of food. When affected by jaundice we must eat only porridge, liquid foods and juices to aid in easy digestion. After the medication we may eat broiled fish, oats and foods rich in carbohydrate. Post full recovery foods such as meat, protein rich foods and fibre rich foods can be consumed. Bile is necessary for the assimilation of fat. With the wrong choice of foods, the liver must have to work more to process the food. It should be avoided as it may further strain the body. Treatment for jaundice normally target the specific reason rather than jaundice. A person affected by jaundice will be diagnosed based on their history, age, symptoms and other factors.Only after the doctor has assessed the reasons for the jaundice the patient will be treated accordingly. The intensity of the infection of jaundice can be performed by a variety of tests but if cannot fully diagnose the reasons so some tests are taken to confirm jaundice. The levels of unconjugated bilirubin pertaining to the conjugated bilirubin levels are monitored to indicate excessive breakdown of erythrocytes. It monitors the levels of red blood cells, white blood cells and platelets. This tests are done to check whether it is hepatitis A, B and C.
This test with the help of magnetic signals develop the image slices of the soft tissues of the human body to check the reason and location of obstruction in the bile duct. This test uses sound waves of high frequency to form a two-dimensional image of the soft tissues to identify stones in the gall, tumors and the dilated bile ducts. -It is known as Computerized Tomography. It uses a thin X-ray beam to develop images of soft tissues to display any tumors and bile ducts that are dilated. This test involves the patient to swallow an endoscope tube that gets down the bile duct. With the help of a x-ray contrast solution secreted, the contrast-filled bile duct are shown in an x-ray to check the reason and placement of an obstruction bile duct. Certain foods are avoided to help in fast recovery from jaundice because they obstruct the easy recovery of liver and its related functions. For a quick recovery from jaundice the person must refrain from salt. Adding salt on a regular basis to foods slow down the deterioration of liver cells. So salt rich foods like pickles and certain fish varieties must be avoided. All types of meat should be avoided when affected by jaundice. Meat have high level of saturated fats in them which slows down the recovery from jaundice. After the patient recovers completely it is permitted to eat meat. Milk products must be totally avoided if one has jaundice. The milk products include cheese, butter, buttermilk, curd and margarines. Eggs are difficult to digest as they have high amount of protein. The livers finds it difficult to digest the eggs so it is advised to refrain from eating eggs. After one recovers the eating of eggs are permitted. Caffeinated drinks like tea and coffee should not be drunk when suffering from jaundice. They may slow down the fast recovery from jaundice and damage liver further. These are most dangerous foods when it comes to avoiding foods when affected by jaundice. They contain more amount of oil, fat and other adulterated materials that deteriorate the health and body of the person. At the time of jaundice the nitrogen cannot be excreted from the body because the body cannot properly perform its metabolic activities. But eating beans will exert over load to the body and result in delay in recovery from jaundice. Banana should be avoided when suffering from jaundice. Bananas are rich in fibre content which exert much pressure on the digestive system. It also increases the level of bilirubin in the body which increases the effects of jaundice. These two substances should not be consumed when suffering from jaundice. These are rich in saturated fats that is harmful for the health and exerts further stress to the body. Daily intake of butter must be only about 7 percent of the normal total calorific intake. These are rich in proteins and fibre. 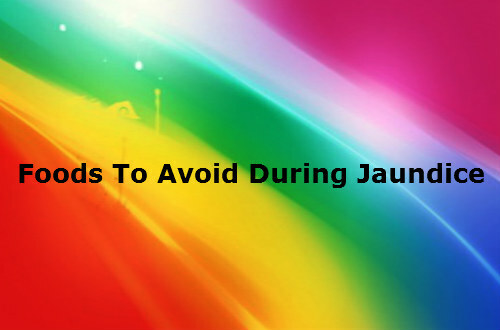 These cause distress to the digestive system and hence must be avoided during jaundice. They also cause putrefaction in the lower intestines which must be refrained from by human beings. When affected by jaundice drink lots of water. This helps in the elimination of toxins and the bilirubin from the body in the feces and urine. Juicy foods and fruits should also be consumed in large quantities. We must avoid alcohol as it may seriously affect liver. If the bilirubin level becomes normal we must start to eat rice and porridge. After the bilirubin level has become stable we may eat meat and high protein diets.